Note that these are not the most recent state and local sales tax rates. For 2018 data, click here. In addition to state-level sales taxes, consumers also face local sales taxes in thirty-eight states. These rates can be substantial, so a state with a moderate statewide sales tax rate could actually have a very high combined state and local rate compared to other states. 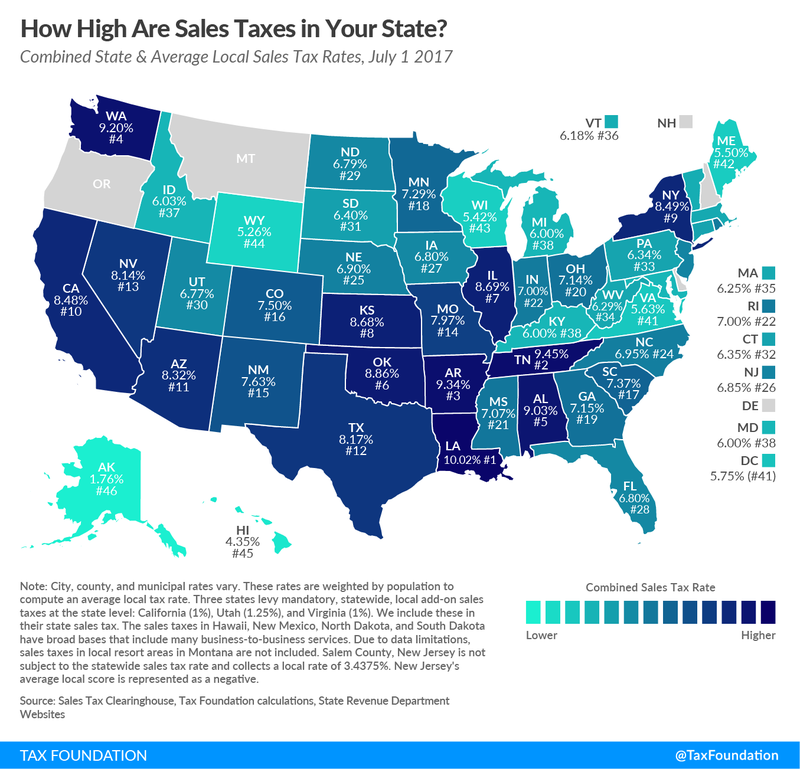 This report provides a population-weighted average of local sales taxes as of July 1, 2017, in an attempt to give a sense of the average local rate for each state. Table 1 provides a full state-by-state listing of state and local sales tax rates. The five states with the lowest average combined rates are Alaska (1.76 percent), Hawaii (4.35 percent), Wyoming (5.26 percent), Wisconsin (5.42 percent), and Maine (5.5 percent). California has the highest state-level sales tax rate, at 7.25 percent. Four states tie for the second-highest statewide rate, at 7 percent: Indiana, Mississippi, Rhode Island, and Tennessee. The lowest non-zero, state-level sales tax is in Colorado, which has a rate of 2.9 percent. Five states follow with 4 percent rates: Alabama, Georgia, Hawaii, New York, and Wyoming. No states changed their statewide sales tax rates since January. In California, Los Angeles County implemented a voter-approved 0.5 percentage point sales tax rate increase effective July 1, 2017. In Georgia, the City of Atlanta imposed a legislatively-authorized sales tax increase to fund the city’s light rail system, effective March 1, and both Atlanta and Fulton County adopted additional sales taxes for transportation projects more generally, effective April 1. In South Carolina, several counties adopted new 1 percentage point capital projects sales tax levies, while Charleston County increased its transportation sales tax from 0.5 to 1 percent, operative May 1, on the basis of voter referenda. In Nevada, Clark County (which includes Las Vegas) implemented a 0.1 percentage point sales tax increase for law enforcement personnel costs, while Washoe County (where Reno is the seat) adopted a 0.54 percentage point increase for school construction, both effective April 1. Washoe County’s tax increase was ratified by the voters, while Clark County’s was approved by the county commission under new legislative authorization. 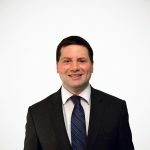 It must be noted that the border county of Salem County, New Jersey, is exempt from collecting the 6.875 percent statewide sales tax and instead collects a 3.4375 percent (half-rate) tax, a policy designed to help local retailers compete with neighboring Delaware, which foregoes a sales tax. We represent this anomaly as a negative 0.03 percent statewide average local rate (adjusting for population as described in the methodology section below), and the combined rate reflects this subtraction. Despite the slightly favorable impact on the overall rate, this lower rate represents an implicit acknowledgment by New Jersey officials that their 6.875 percent statewide rate is uncompetitive with neighboring Delaware, which has no sales tax. (c) The sales taxes in Hawaii, New Mexico, North Dakota, and South Dakota have broad bases that include many business-to-business services. (d) Due to data limitations, sales taxes in local resort areas in Montana are not included. (e) Salem County, New Jersey is not subject to the statewide sales tax rate and collects a local rate of 3.4375%. New Jersey’s average local score is represented as a negative. It is worth noting that population numbers are only published at the ZIP code level every ten years by the U.S. Census Bureau, and that editions of this calculation published before July 1, 2011, do not utilize ZIP code data and are thus not strictly comparable. California Board of Equalization, “New Sales and Use Tax Rates for Los Angeles County Operative July 1, 2017,” https://www.boe.ca.gov/pdf/l499.pdf. Georgia Department of Revenue, “Policy Bulletin SUT-2017-01” (Jan. 19, 2017), https://dor.georgia.gov/sites/dor.georgia.gov/files/related_files/document/LATP/Policy%20Bulletin/SUT-2017-01___New_Local_Taxes.pdf. South Carolina Department of Revenue, “Local Tax Rate Changes Notification ST-588” (Jan. 26, 2017), https://dor.sc.gov/tax-index/sales-and-use/Sales%20Notices/ST588_1262017.pdf. Sean Whaley & Sandra Chereb, “Nevada Legislature Approves Sales Tax Hike for Clark County to Hire More Cops,” Las Vegas Review-Journal (Oct. 14, 2016), https://www.reviewjournal.com/news/politics-and-government/nevada/nevada-legislature-approves-sales-tax-hike-for-clark-county-to-hire-more-cops/. Trevon Millard, “Washoe Voters Pass Sales Tax Increase for School Construction,” Reno Gazette-Journal (Nov. 8, 2016), http://www.rgj.com/story/news/politics/2016/11/09/looking-likley-washoe-pass-sales-tax-increase-school-construction/93497640/. Mehmet Serkan Tosun and Mark Skidmore, “Cross-Border Shopping and the Sales Tax: A Reexamination of Food Purchases in West Virginia,” Working Paper 2005-7, Regional Research Institute, West Virginia University. http://rri.wvu.edu/wp-content/uploads/2012/11/Tosunwp2005-7.pdf. See also, Randolph T. Beard, Paula A. Gant, and Richard P. Saba, “Border-Crossing Sales, Tax Avoidance, and State Tax Policies: An Application to Alcohol,” Southern Economic Journal 64, No. 1 (1997): 293-306. Susan Chandler, “The sales tax sidestep,” Chicago Tribune (July 20, 2008), http://articles.chicagotribune.com/2008-07-20/business/0807190001_1_sales-tax-tax-avoidance-tax-landscape. Art Woolf, “The Unintended Consequences of Public Policy Choices: The Connecticut River Valley Economy as a Case Study,” Northern Economic Consulting (Nov. 2010), http://www.documentcloud.org/documents/603373-the-unintended-consequences-of-public-policy.html. Len Lazarick, “Raise taxes, and they’ll move, constituents tell one delegate,” Marylandreporter.com (Aug. 3, 2011), http://marylandreporter.com/2011/08/03/raise-taxes-and-theyll-move-constituents-tell-one-delegate/. 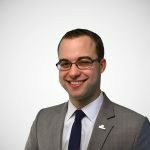 For a list, see Jared Walczak, Scott Drenkard, and Joseph Henchman, 2017 State Business Tax Climate Index, Tax Foundation (Sept. 27, 2017), https://taxfoundation.org/publications/state-business-tax-climate-index/. Liz Malm and Richard Borean, “How Does Your State Sales Tax See That Blue and Black (or White and Gold) Dress?” Tax Foundation (Feb. 27, 2015), http://taxfoundation.org/blog/how-does-your-state-sales-tax-see-blue-and-black-or-white-and-gold-dress. Justin Ross, “A Primer on State and Local Tax Policy: Trade-Offs Among Tax Instruments,” Mercatus Center at George Mason University (Feb. 25, 2014), http://mercatus.org/publication/primer-state-and-local-tax-policy-trade-offs-among-tax-instruments. For a representative list, see Walczak, Drenkard, and Henchman, 2017 State Business Tax Climate Index.